Interspersed with those growls were long, marvelous talks, perhaps in the great leather couch in his beloved Anglers’ Club before a bright log fire, both our suits burning in a couple of places from hot cigar or pipe ashes. One minute he’d introduce me to a gigantic mutt named Mange, who could perform amazing feats with food and devour the refuse of his entire ambulance detachment in the mud and bivouacs of France in 1917, the next he’d be railing against salmon fishing, because when he caught a fish, sir, he wanted to know why the beggar took the fly. Sitting there, chuckling away, in danger of being burned to a crisp, we used to vow that someday we’d go winter camping together. He was tough enough to have done so well into his eighties; I was the cream puff. He had a thousand tales. A dozen times I heard him tell the long, rambling, hilarious “fly in the nose” story, about a friend who got a Fan-Wing Royal Coachman caught in the tip of his nose on a Sunday morning in Pennsylvania, and though he always carried a tackle box filled with a thousand gadgets, he could not find one with which to extricate himself; the story progressed to a diner, where a waitress was terrified by his odd nose-dress, and then to the sudden discovery that his car was on fire, then a rattlesnake somehow appeared mysteriously, and finally—an hour after he’d begun the tale—his friend tumbled down a hill and knocked the senior member of the Parkside Anglers Association nearly senseless—twice. He had tales about Mr. Hewitt, whom he had known well and loved and always called “Mister,” and LaBranche, Roy Steenrod, and the Brooklyn Fly Fishers; he had serious reservations about Theodore Gordon because the man had abandoned his sick mother. Sparse’s other nickname was Deac, from Deacon, for his moral uprightness. He was adamant one June when I told him I had not yet been on the water. It was a disgrace. He growled and promptly hauled Mari and me off to the DeBruce Club on the Willowemoc. We fished a little together—he was a deft left-handed caster—and he showed me where LaBranche cast what he called the first dry fly on American waters. Then he said, “You’ve been working too hard. You need an uninterrupted couple of hours on the water to refresh yourself, bub. I’ll entertain your missus.” And he sat with Mari at the kitchen table in the Krum farmhouse and told her, in great detail, for four hours—the information being somewhat more than she wanted—about ballistics and maneuvers on the Mexican Border Patrol. He was astonishingly precise about a great variety of gadgets and contraptions, some in common use, some of his own invention—like the zipper for chest waders and the attachment that kept you from dropping your pipe into the drink. No matter that the former leaked and when the pipe slipped it only dropped hot ashes down your waders. I’d heard the “fly in the nose” story a dozen times and I was at the lunch table five years ago when Sparse began to tell it, faltered, and his great memory failed. I did not tell him to tell that story the last time I saw him, on his ninetieth birthday. Frail, shrunken, he had lost over eighty pounds. Hoagy Carmichael had rigged him a hat with a wire brace screwed into the cloth so that he could hold a pipe in place without using his hands and not incinerate himself; the old guy loved the idea of it. I wanted to hear Sparse tell one of the old tales once more and prodded him to tell me the “prune rod” story. He did so, as well as he’d ever told it—about his father’s belief (when Sparse was eight years old) in the health-giving properties of prunes, the deal struck to eat twenty-five prunes for a nickel (with a limit of fifty per week), the rod eventually bought from the proceeds of this worthwhile activity—and then he produced the huge hickory club itself. Like the hickory “prune” rod, brilliantly waxed and protected after eighty-two years, better than it had ever been or deserved to be, whatever Sparse touched became richer, finer. A friend’s prose, a lunch at which he unfolded one of his inimitable stories, a day on the Willowemoc with him, a thousand lives he touched, a memory, an Anglers’ Club Bulletin edited with his discerning eye, an event he’d lived or carefully researched—all were brighter, more memorable for his ministrations. He could make us laugh with a fantastic story about a fifty-pound brown that devoured pieces of bread soaked in scotch and make us cry when we read “A Drink of Water.” Nearly blind in one eye and with only 20 percent vision in the other, he was still the most meticulous proofreader I ever knew and always the firmest, most exacting critic. He saw more than any of us, remembered it precisely, and then crafted his words with choicest care. The trout were not taking, but a boy along on the trip “rose to chocolate bars all day long”; some of the finest fishing is in print; he always wanted to fish “not better but more.” His counsel and encouragement to a hundred lesser writers, some quite famous, has yet to be chronicled properly, and his own prose remains a constant lesson. The day after his first growl, he gave me “Murder” to use, and he kept giving for fifteen years—a score of unforgettable moments and a piece of his heart. With a roar like a werewolf, Sparse could not hide that he was really mostly a gentleman and a lamb. He practiced a code from another, nearly forgotten time, and it included strong doses of honor, steadfastness, loyalty, dignity, backbone, pride, the art of making truly careful sentences and the art of being a gentleman, and love. He had been a reporter for the Wall Street Journal and then, until several years earlier, a stockholder-relations counsel; he went to work every day, well into his eighties. In his last years, old age did its best to ravage him. The doctors rummaged around inside him and did their worst; at times he had tubes attached here and there and less than a full complement of parts. But most painful must have been the loss of his beautiful and astonishing memory, which no doubt had helped him become the debating champion of New York State long before the First World War. Hoagy, who saw him a couple of weeks shy of his ninety-first birthday, reported that the only gift he wanted was “the ticket out of here.” He died on Veterans Day and would have liked that. Everyone who knew Sparse will miss him sorely—not because he was always an easy man, which he wasn’t, but because there is not a chance, buster, that we shall see your likes again. 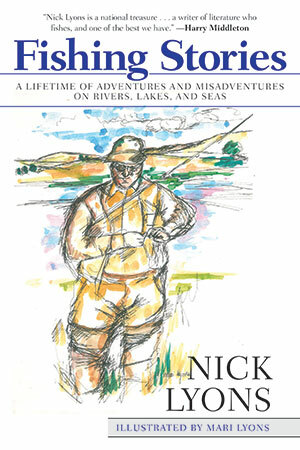 He imputed to the world of fly fishing, which he loved deeply, a sense of character and tradition and wit; he saw it as a human activity, full of wonder and excitement, far beyond the mere catching of fish—an activity that enlivened the heart and sparked the imagination. It had the power to bring out the best in men—and some of the worst. He told us about the stupidity of much high-pressured “sport” and the fun we might have on our fishless days. He was far more than what he’d admit to: “Merely a good reporter, bub.” He was a superb writer who will be read a hundred years from how, and a great-hearted, humorous, and perfectly remarkable man. It is winter now and I delight to imagine us finally off someplace in the snow, sitting on a log, puffing at pipes whose ashes sizzle and sink as they hit the snow. “Why don’t you just tell me that ‘fly in the nose’ story one more time, old friend,” I say. He grunts and chuckles and screws up his face, then says, “Well, it was an early Sunday morning in Pennsylvania, buster and …” And my face kept aching from laughter and I didn’t notice the cold, and finally, like some great chord, the senior member of the Parkside Anglers Association gets knocked nearly senseless for the second time.